This beautiful photograph was purchased by Rev. Merlyn Vantran and his wife Grace sometime in the 1950s. It was by Clark Rice, a well known photographer from nearby Perry, New York. The image shows the "Tea Table", an unusual natural rock formation that once stood on the west side of the gorge north of Wolf Creek. During the 1930s a picnic area, including a shelter, stone tables and a parking lot was built nearby by the Civilian Conservation Corp. This photograph was purchased in the 1950s by Reverend Merlyn Vantran and his wife Grace. It was at the Tea Table picnic area in the late 1940s that Reverend Vantran, the minister of the Methodist Church in Wyoming NY, attended a church social at the Tea Table picnic grounds. He was seated (perhaps purposely) beside Grace Allen of York. The couple fell in love and were married in 1951. Letchworth and its Tea Table area continued to be an important part of the Vantran family. Although life took them to several churches in Pennsylvania and Western New York over the years, the Vantrans and their daughters Deb and Doreen always remained close to the Park. 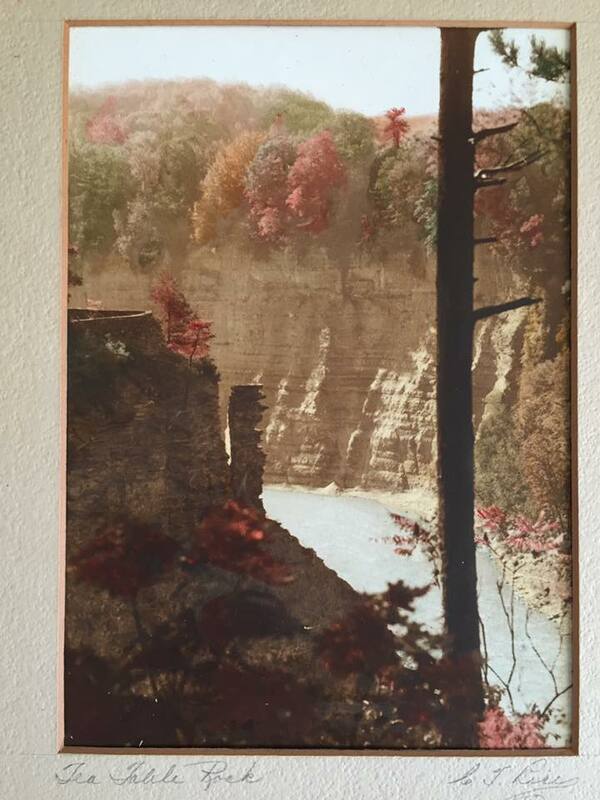 This photograph and one of the Upper Falls were always hung in the family's livingroom, and as Deb Vantran Curtis writes, "...we made numerous camping trips & day trips as a family (to Letchworth) ....the trips continued with my children & now my grandchildren. I 'go home' every time I enter the Park!" Around 1950 the formation fell prey to time and erosion and collapsed into the river below. Although the actual Tea Table is gone, its memory lives on at nearby shelter and picnic area, through photographs, and in the hearts of the Vantrans and other families who have a deep connection to Letchworth State Park. Special thanks to Deb Vantran Curtis for allowing us to post this photograph and their family story! Remember - if you have a favorite family photograph and Letchworth Park story, you can contribute them to our Memories page!